“Cousin Courtney” is the daughter of my “Auntie Roxann” – one of the Butter Sisters. She recently went back to work and – like many of us – is juggling work, family and food. When she found out that I had a stash of family-friendly recipes she asked me if I could start sending her ideas. She lives in Seattle – one of my favorite cities, mostly because seasons actually change there. I’ve lived in the Pacific Northwest twice – once in Seattle and once in Portland – and I loved this time of year because it meant making homemade soups, roasting anything I could get my hands on and baking until the cows came home. So I was really excited when she asked me for dinner ideas because it meant that I could vicariously experience a REAL fall. I shared a few recipes and asked her to call me the following week to let me know how it went. All went well the first week – she’s a pretty good cook in her own right – so I wasn’t really surprised. For the next week I suggested she try roasting a chicken. She said, “My mom does that all the time and it’s so good. Sure, I’ll give it a try.” I gave her a few side dish ideas and sent her on her way. 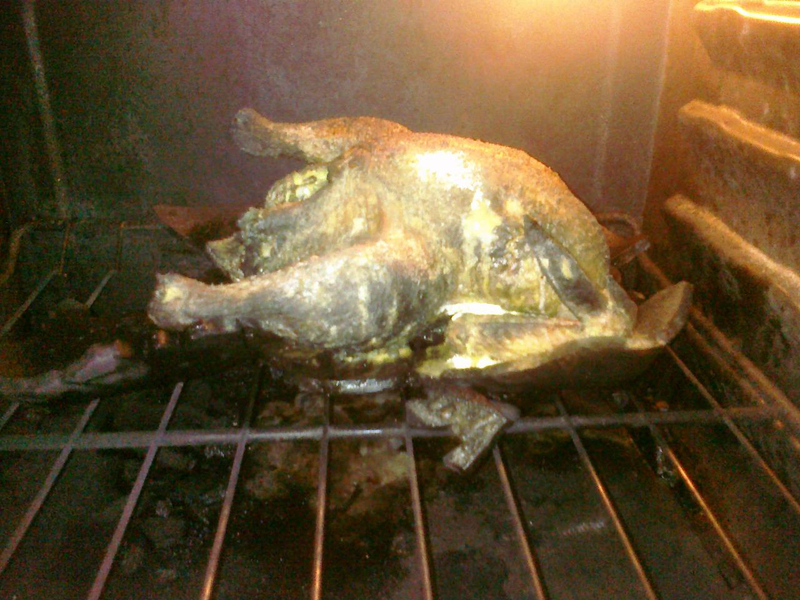 My chicken: 😦 lol….and I was so excited, I even got an organic free range veg fed chicken dammit…. She then went on to explain that the glass pan exploded and started a fire in her oven. The dish wasn’t cold so she wasn’t sure what had happened. Luckily she had a fire extinguisher (safety first in the kitchen!) but she wouldn’t be able to use her oven for awhile. I’m not sure why the glass pan exploded, but I suspect it might have had something to do with the drippings, oven temperature and age of the glass. (I once had a full glass pan of cooled enchiladas shatter when the corner of the pan hit the edge of the refrigerator just so.) I – thankfully – have never had that happen since I use a metal roasting pan. From now on I think I’ll just stick to sending her stove top recipes.